T is for Tower. Of the Elementalist. Of plaster, green and swirled, round, and four stories high. That’s from James Pacek’s The Wilderness Alphabet. From Archway to Ziggurat, it’s a collection of tables of things to find in the wilderness when randomness is useful. Next, add a stout round altar with a trapezoidal base, and written on it… and epitaph. The altar comes from Richard J. LeBlanc Jr.’s A-to-Z d30 tables, and the epitaph from Risus Monkey’s DungeonWords. LeBlanc is into the d30, and while he just started his A-to-Z series he has several other d30 tables already done, including a dinosaur table! Need a random dinosaur? How about number 17, the ornithomimus! “Very intelligent: surprises on 1-2 (on 1d6)”. The d30 tables and DungeonWords are free; The Wilderness Alphabet is available on Lulu.com in a nice 6x9 paperback with illustrations. 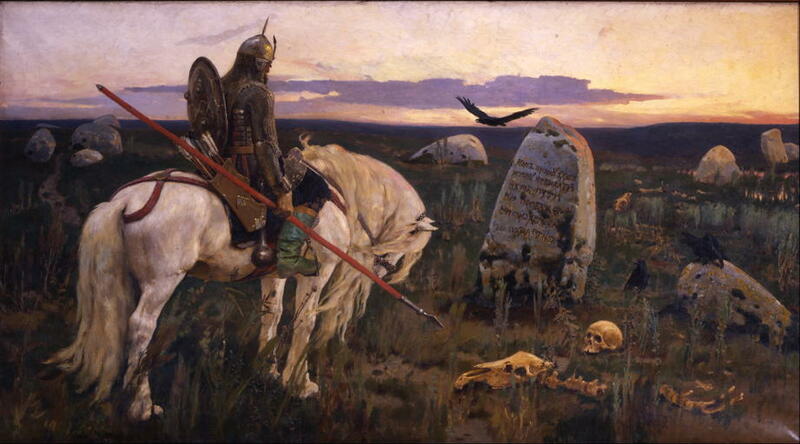 For his cover, he uses the very appropriate Knight at the Crossroads by Russian folklorist painter Victor Vasnetsov. All of these tables will, of course, work very handily with the random item Python script described in Programming for Gamers: Choosing a random item and included with the The World of Highland Guidebook resources archive. The wilderness letter choice is a percentile-based breakout table, and almost everything else is a simple list. These tables are the kinds of things I might use on or just before game day when I need a new adventure and don’t even have the nut ready. A random roll, and sure enough, a tower is a good place to start, and an elementalist a good way to theme it. And then at the center of the tower, an altar? I can run with that pretty quickly. And the altar contains an epitaph? Oh, my, who died, and why is their epitaph on the altar at the center of this green tower? Oh yes, that’s making me want to stop writing this blog post and start writing that adventure! A d30 table for every letter of the alphabet… or at least, that’s the challenge! Highland provides a context for Gods & Monsters adventures. Highland is designed for the rural adventurer, where characters begin in small villages or remote areas and move in towards civilization as they learn more and more about their world’s past. It was designed as a version of the standard fantasy world imprinted on the American old west. “Where I come from, graveyards are for dead people,” Arthur said. “How unimaginative,” said the Rabbi. “Who decided to waste graveyards on dead people?” asked the Priest. T is for Tower… of the Elementalist last modified April 2nd, 2014.